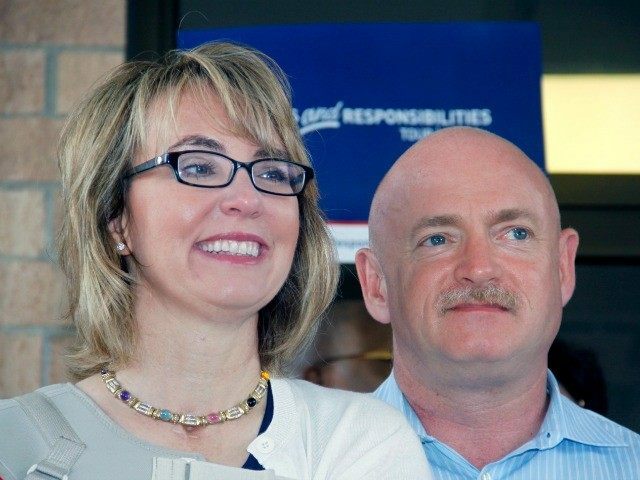 On Sunday, CBS News Sunday Morning aired video of gun control proponents Gabby Giffords and Mark Kelly shooting handguns and rifles, then panned to video of the couple sitting in their Tucson, Arizona, home where Giffords talked about the possibility of running for office again. Then the heinous attack on Sandy Hook Elementary took place. The first big gun control effort post-Sandy Hook was the failed push for Sen. Joe Manchin’s (D-WV) expanded background checks bill in 2013. And on March 4, they took up the push again, as Giffords’ stood with Democrats on Capitol Hill demanding that people at gun shows be forced to go through the same background check her attacker, Jared Loughner, passed in 2010. Cowan covered aspects of the couple’s gun control push as he discussed the formation of their gun control PAC, “Americans for Responsible Solutions,” which “raised millions for gun control.” He then brought up the “speculation” that Giffords or Kelly of them might run for office in the future.